Viewed from the top of the Torre Grossa: San Gimignano and the hills beyond. 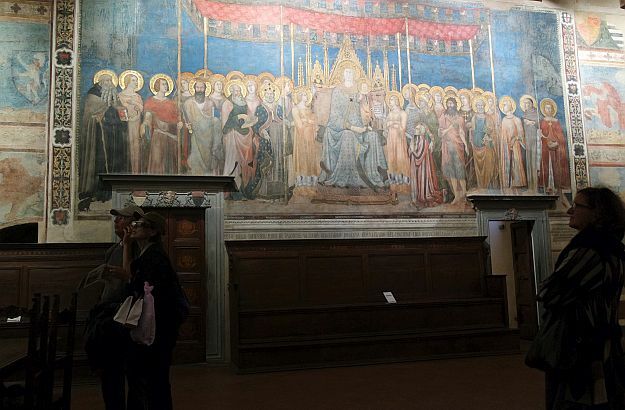 Lippo Memmi’s Maestà is exhibited in the Sala Dante of the Civic Museum. 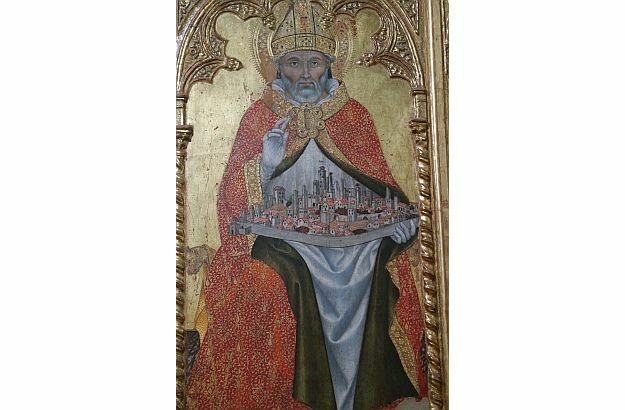 The town’s towers are depicted on this painting in the Palazzo Comunale. In winter, you won’t have to jostle to enjoy San Gimignano’s attractions. Saffron was originally used as a pigment and a medicine, not as a spice. The best season to visit Italy can sometimes be… winter! Yes, the cold season. 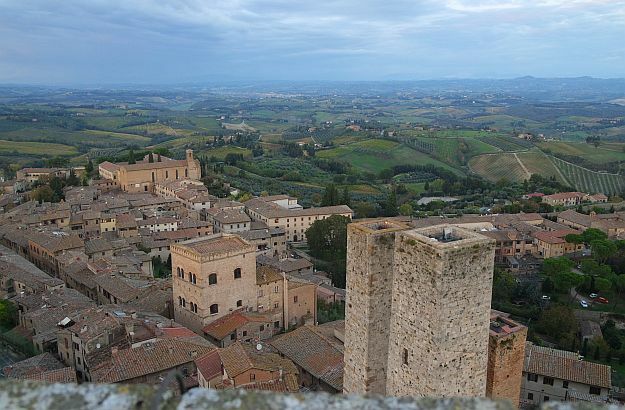 Take the small hill town of San Gimignano, for instance – known as the “Town of Fine Towers”, and also nicknamed the “Manhattan of the Middle Ages” or “Manhattan of Tuscany”. 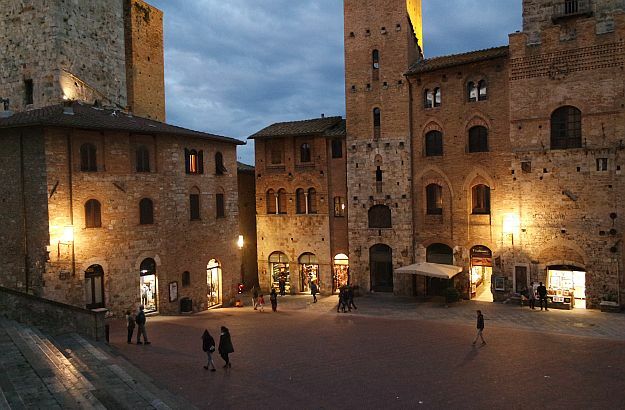 The historic centre of San Gimignano, by the way, became a UNESCO World Heritage Site in 1990. Each year, during the high season, San Gimignano and its striking medieval towers attract a huge amount of visitors; and the only way to avoid the crowd is by arriving early in the morning or late in the afternoon, that is before or after the throng of tourists brought in by the countless tour buses. But during winter, you don’t have to worry about scheduling and organizing your visit at the right moment. Whatever the time you arrive in San Gimignano, you won’t have to jostle and push your way through the crowd. A few weeks ago, in November, a good friend and I took our courage in both hands – I should probably say “in both feet” here – and climbed up the steep stairs of the Torre Grossa, one of the town’s fifteen surviving towers, and the highest of them all. It was a windy day, and we definitely needed our coats; but we had all to ourselves the whole tower and the magnificent view it offers at its summit. The Torre Grossa is accessed via the Civic Museum located in the Palazzo Comunale. Worth a visit even if you don’t feel like ascending the tower, this museum has a hall called the Sala Dante – where the Florentine poet gave a speech in 1299, hence the name, – and which exhibits a beautiful fresco by Lippo Memmi, executed in the tradition of Duccio’s and Simone Martini’s Maestà. After our laid-back and very rewarding sightseeing, we went for dinner to Fattoria Poggio Alloro, a Tuscan family farm within a stone’s throw of San Gimignano. Luck was on our side: we arrived just in time to watch part of the saffron harvest. 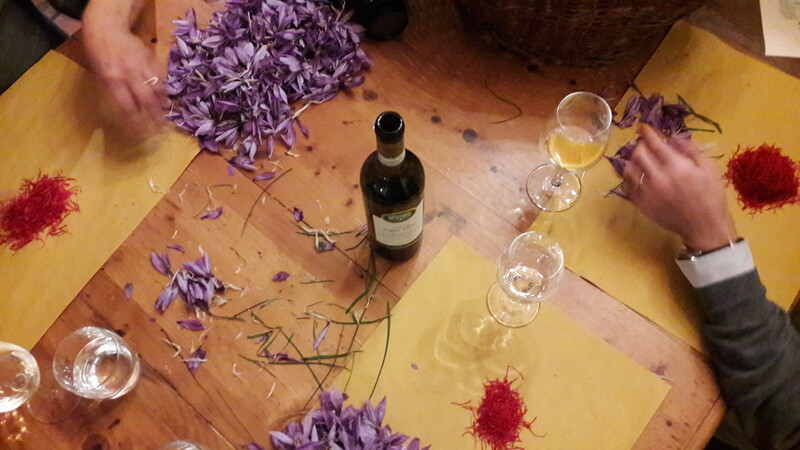 I had no idea that the precious flower is traditionally picked in November, and neither did I know that saffron has been grown in San Gimignano since the Middle Ages! However, in these remote days, the valuable stigmas were not used for cooking, not yet, but as a dyeing pigment and a natural medicine. Don’t we always have something new to learn!